NEW BRITAIN - The Hearts (Waterbury) left New Britain High School with some hardware. 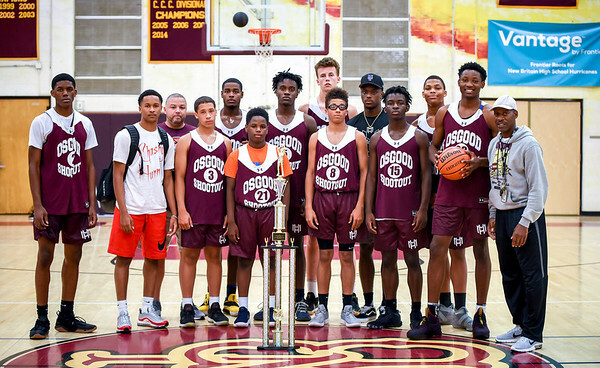 Behind a dominant first half, the Hearts rolled to an easy 78-64 victory over CT Flight (Leyard) to win the 26th annual Osgood Shootout High School Division Sunday. Jon Kuminga was named the division’s MVP and led Waterbury with 37 points, including four 3-pointers, all within the first half. Nate Tabor added 20 points and three 3’s of his own. Max Edwards led CT Flight with 26 points, scoring three 3’s in the second half. The Hearts controlled possession for the nearly entire first half and jumped out to an early 13-4 lead after the first five minutes. It wasn’t until midway through the half the CT Flight were able to get things going. Ledyard held Waterbury scoreless for five minutes, using strong defense to go on a 7-0 run. But CT Flight’s run was a short one as the Hearts went on an 11-point run of their own to end the half. Kuminga had a lot to do with that. The MVP scored 19 points after halftime. The Osgood Shootout gives numerous teams the opportunity to focus on their skill set before the start of school year and season. Sacred Heart finished last season as the runner-up to Notre Dame-Fairfield in the CIAC Division I boys basketball tournament. But for some, there’s anyways something special about the Osgood. Heron enjoys bringing his team back to the Osgood Shootout every year. When he was younger, he would participate in the tournament and knows the benefits it provides teams, especially the younger ones, with the competition it provides. Now, the Hearts are heading back to Waterbury with some quality experience. Bringing back the trophy isn’t too bad either. Posted in New Britain Herald, General Sports on Sunday, 19 August 2018 20:59. Updated: Sunday, 19 August 2018 21:01.